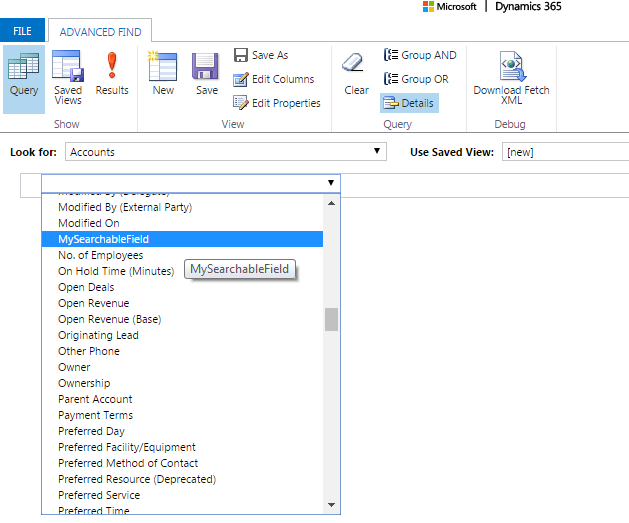 Dynamics 365 allows you to create new fields for new/existing entities. When creating a field, there are number of properties that we need to configure. For most properties you can leave the default unchanged. In this article, I’ll look a closer look at the property Searchable. The official Microsoft Documentation can be found here. 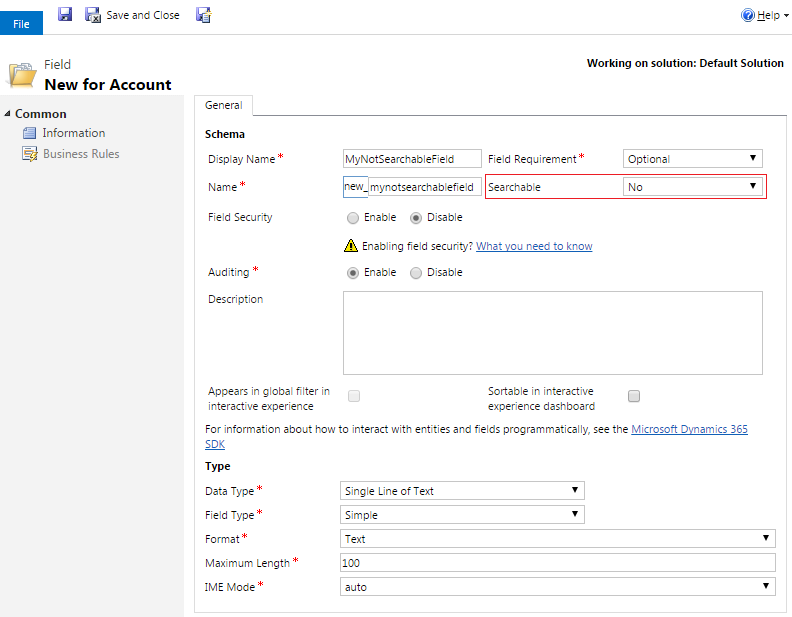 Searchable – When a field is searchable it appears in Advanced Find and is available when customizing views. Use this when there are fields for the entity that you don’t use. Setting this to No will reduce the number of options shown to people using advanced find. Allow me to explain further. 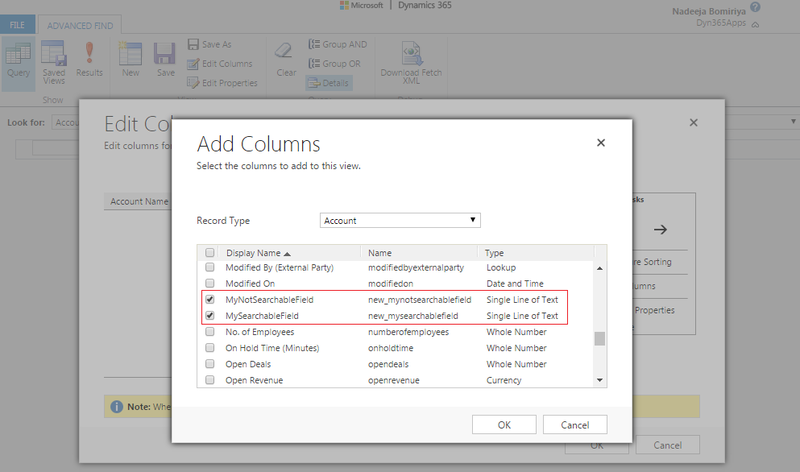 Let’s create a two new field in Accounts entity; MySearchableField and MyNotSearchableField. As you can see, I have set the Searchable property to Yes for the MySearchableField. I have set the Searchable property to No for the MyNotSearchableField. Save and Publish. Let’s see how Advanced Find looks like. When you configure filter criteria, and you want to select a field, only the fields with Searchable property set to Yes are visible. In this example, MyNotSearchableField is not visible, since the Searchable property was set to No. Let’s try to add more columns to the view. Interestingly, both fields are available, regardless of the value set in Searchable property. Also note, this property has nothing to do with the behaviour of the Global Search, Quick Find Search, or Relevance Search. 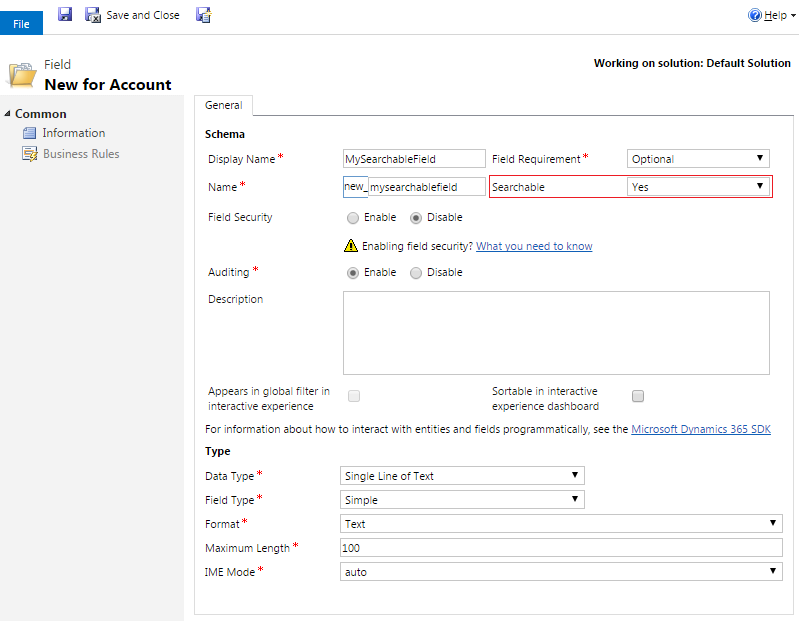 To understand how to configure fields searchable in Global, Quick Find, and Relevance Search, check out the below article. Setting Searchable property to No, makes the field disappear from the available fields for the Filter configuration, but it won’t hide the field when adding columns to the view. This property has no impact on behaviour of the Global and Quick Find Search.